This entry was posted in Tweetspeak and tagged Erasure Poetry, This Week's top 10 Poetic Picks, Wave Books. Bookmark the permalink. Lexi, I’m so glad you played with the erasure poetry. Did you see Sandra’s erasure poems, too? 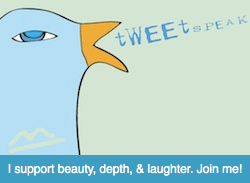 Thanks for stopping by Tweetspeak and for the shout out here on your blog. I’m so glad you like our Thursday Top Ten.